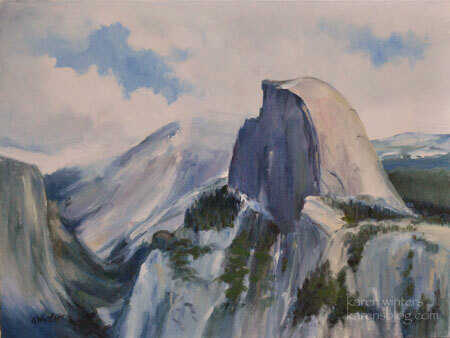 From the valley floor, Yosemite’s Half Dome is a lofty structure. But it is only from Glacier point, when you can look across the valley at it, that you see the true size of Yosemite’s massive landmark. This painting depicts the monumental formation in early summer, when there is still some snow evident on its flanks. Soon, the snows will come and shroud it in whiteness once again. What a wonderful picture, thank you so much for sharing this with us!